Orang-utan Gang is the fifteenth level of Donkey Kong Country, as well as the fourteenth level of its Game Boy Advance remake. 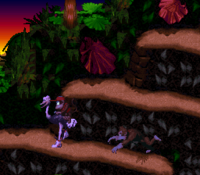 It is the fifth level of Vine Valley in the original Donkey Kong Country, along with the fourth area of the same world in the Game Boy Advance version (due to Temple Tempest being pushed to the sixth level of the world). 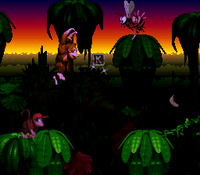 This level takes place in the jungle on the treetops during sunset. The area introduces Manky Kongs, who throw barrels at the heroes. Expresso the Ostrich also appears and can help the Kongs reach Bonus Areas. This level has the most Bonus Areas in the game, with a total of five. Diddy rides down some vines on a barrel. The primates ride on Expresso in an area shortly before the Star Barrel. The Kongs begin the level on a long line of treetops that are followed by two higher treetops. The sets of trees are connected by vines that Kritters bounce along. Behind this area, the primates can find a Zinger circling a Steel Barrel. Another vine is ahead of the area that connects the previously mentioned pair of trees to another pair. A curved trail of bananas nearby lead the heroes onto a solid area of land with a Klaptrap on it. The Kongs can find more land below it that holds a DK Barrel and another Klaptrap. 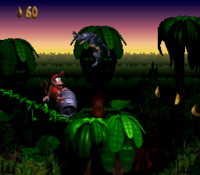 This area of ground is followed by a large abyss containing three sets of treetops that are all connected by two strong vines that can hold the Kongs' weight. They also hold up the many Kritters that hop along them. A small gap is present after the third set of trees, and a Zinger circles the letter K above it. Four more sets of treetops are ahead, all of them having vines to be used as bridges. 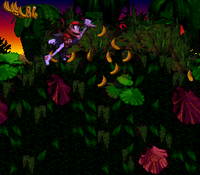 After reaching the fourth set of treetops in this area, the Kongs can find a large piece of land ahead of them the consists of many ledges that hold a few Klaptraps. The bottom of the land area features a few small gaps. A small platform between the pits holds the letter O. The duo can also find a crate containing Expresso on the top of the area, which is followed by a set of treetops that hold the level's Star Barrel and a Klaptrap. A small gap separates these trees from the following treetop, but the primates can cross it with a simple jump. The primates can find the second DK Barrel in the level on the top of the lone tree following the abyss. The tree is connected by a vine to a group of four neighboring treetops that hold a barrel-throwing Manky Kong. The vine can be used as a bridge to reach the trees, which are followed by a small pit with another tree standing in it. They can find a Steel Barrel on top of the large plant. After crossing another small pit, the primates reach a lone tree that is connected to another two trees by a vine that the heroes can travel along. The two trees at the end of the vine carry a Manky Kong. A small pit is ahead of the foe that is followed by two more trees that are connected to another pair of trees with a vine. Barrels from a nearby Manky Kong roll down the vine as the Kongs travel along it. After they pass this Manky Kong, they make their way onto another area of land that consists of a few large ledges. A path hangs off of the front of the area that the Kongs can walk along to find a Klaptrap and the letter N. They can find an additional Klaptrap on a higher part of the large platform, which is immediately followed by a pair of trees that hold a DK Barrel. Four more sets of trees stand in the abyss ahead of here. They are all connected by slanted vines that hold several Kritters. Two Manky Kongs are also located in the middle and end of the area, hurling barrels down the vine bridges. Once they pass the second Manky Kong, they reach another large area of land that features a large alcove containing two Kritters. A barrel also sits on the end of it. The Kongs can also find a tall piece of land behind it that they can reach with Expresso. A tire that can help the Kongs break some distinguished pieces of the ground on this raised area. Objects, such as a DK Barrel, are released from the ground when they are broken. After the heroes make their way across the whole area of land, they find two pairs of trees that are connected by twisted vines that they can use as bridges. A Manky Kong hurls barrels down the vine as they progress. Once the heroes pass the Manky Kong, they reach a large area of land with a sign on it, indicating that the level is near complete. If they manage to climb over a raised piece of land with a Kritter on it, they find an exit sign. A tunnel leading out of the level is ahead of it. Donkey Kong jumps toward the letter "K". K: Near the beginning of the level, the Kongs can find a small gap between the treetops with a Zinger circling the letter K above it. O: The letter O is directly under Expresso's Animal Crate on a small platform. The Kongs must make a small jump in order to cross the small abyss next to it, for if they jump too high, they land on the higher piece of land instead. N: An area full of Klaptraps is loacted immediately before the second DK Barrel from the Star Barrel. The letter N stands on the edge of a low cliff at the bottom of this area. G: The Kongs should slam onto a distinguished piece of ground in the fourth Bonus Level to break the letter G from underground. To find the first Bonus Level, the Kongs must travel about halfway through the level and find Expresso. When they get on the ostrich buddy, they should head left. When the group makes it to the area in the beginning of the level where two Klaptraps were once found, they have to jump off the edge of the cliff to the left. In the air, Expresso should flutter under the treetops as far as he can go. Soon, the heroes reach a hidden platform with a small cave. They must walk into the entrance to enter the first Bonus Level, where they need to hit several moving letters, which orbit the area. They must be hit in the correct order to spell out each animal friend's name, with the order being Winky, Rambi, Enguarde, and Expresso. If they touch all of the letters in the correct order, they are awarded with an Animal Token of the animal name they have spelled out, and can exit the bonus. To get in the second Bonus Level, the heroes must make sure they have Expresso with them, and then travel to the area with the letter N. Expresso, with the Kongs on him, should jump off of the cliff and flutter over an abyss to the right until he lands on a safe platform. There, they must fly over another abyss and land in an area with a barrel. The Kongs must dismount from the ostrich and break open a nearby wall to reveal an opening. If they walk into it, they are sent into a Bonus Level, where they have to bounce off of a tire and land on certain parts of the ground to find special items, including a DK Barrel, an Extra Life Balloon, and a Banana Bunch. They can exit the stage when they are done through a small opening. 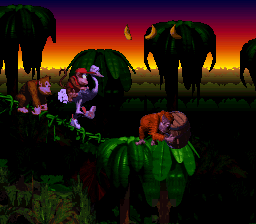 Shortly after exiting the first Bonus Level, the Kongs discover a lone barrel near the treetops. They should pick it up and jump into the small abyss to the right to land in a hidden area. There, they need to fall through the next small gap, still holding the barrel, and then blast open the wall to the left. When it breaks, they must walk into the opening and get into the Bonus Level. There, they must bounce off of a tire and land on two distinguished areas of the ground to win two Extra Life Balloons or Banana Bunches. Once done, they can exit through a nearby opening. When the heroes get out of the third Bonus Level, they end up next to the same barrel. Just as before, they must jump through the closest abyss and land in the hidden area. At this point, they must jump over a small gap (where the third Bonus Level was found before) and bust open the wall to the right. An entryway appears as a result, and they should walk into it to enter the fourth Bonus Level. In this special level, the need to bounce off of a lone tire and land on a distinguished area on the ground to find the letter G. Once they are finished with this, they can exit the bonus stage through a small opening. When the Kongs discover the level's final Manky Kong, they should jump to the right of him and wait a moment. Once the foe throws a barrel at them, they need to hop over it and watch as the barrel crashes into a nearby wall, located near a sign that indicates that the end of the level is nearby. It creates an opening in the wall, which the Kongs must walk into to enter the stage's fifth Bonus Level. There, they have to break a crate with Expresso in it. When the bird is found, they should get on him and ride over a wide abyss, collecting many bananas on the way. At the end of the stage, they can find an Extra Life Balloon to collect, as well as the way out of the stage. 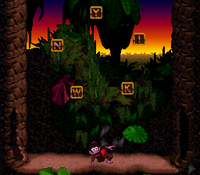 Expresso and the Kongs fly into a camera icon as they travel towards the entrance to the first Bonus Level. The item gives them a photograph of Diddy Kong riding Expresso for their scrapbook. Expresso and the Kongs travel mid-way through the level. Donkey Kong sits on Expresso at the end of the level. Diddy throws a Steel Keg at a Kritter. Diddy reveals an entrance to a Bonus Area. Diddy rides a Steel Keg. The Kongs jump over a wooden barrel. This page was last edited on April 18, 2019, at 21:46.